Waking Up opens with 35 year-old Terry Wise’s graphic recollection of her near-fatal suicide attempt following the death of her husband from Lou Gehrig’s Disease (ALS). This gripping story invites readers behind the closed doors of a therapy office. Speaking from the rarely-heard perspective of the patient, Wise shares unique insights about the entire process of recovery—for people who sit on both sides of the couch. Expounding upon a rare combination of first-hand experiences, Wise articulates pivotal lessons and strategies to navigate the road to emotional health. Alternating between riveting narratives and quick-paced dialogue with her therapist, each chapter offers an intimate look at the work of therapy and the resiliency of the human spirit. Several chapters are devoted to how to cope with the impact of long-term care-giving, grief, and the aftermath of loss. As Wise’s journey unfolds, she and her therapist continue to explore the accumulation of events underlying her depression, including a history of child abuse, while providing a unique look into suicide as can only be told by someone who has survived it. Waking Up is both captivating and educational—teaching professionals from many disciplines, as well as inspiring a broad spectrum of laypersons who have experienced adversity themselves or with family or friends. Specific coping skills and therapeutic techniques are interwoven throughout a journey that teaches us how hope and a thirst for life can be restored. Waking Up is in use at numerous universities, including Columbia, Rutgers, Simmons, Loyola, Northeastern, Gonzaga, Aurora, St. Mary’s, and Sacramento State, and it has been endorsed by prominent experts in related fields. It has also been adopted for use in Crisis Centers and in the suicide prevention training materials for the National Competency Skills-Based Curricula Training Program developed by the American Association of Suicidology. 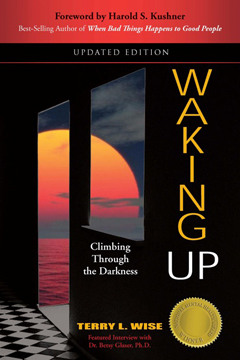 For those in the helping professions, Waking Up is a must read. For those struggling with depression, grief, illness, or suicidal thoughts, this book is a reminder that even when you think it impossible, you can find meaning and a purpose for living when life is not ideal. Regardless of the differences in life experiences, the lessons captured by Wise provide a powerful story of hope and personal triumph.